The GT-1 CENTRIMASTER direct-driven, single inlet centrifugal fans cover air flow rates up to 7 m3/s and pressure rises up to 2000 Pa. 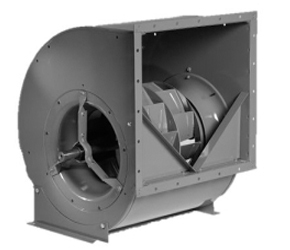 The fan series consists of centrifugal fans available with two types of impeller: – Forward-curved blades for the GTLF fans – Backward-curved blades for the GTLB fans The design of the fan inlet is of vital importance to achieve high fan efficiency and a low level of noise generated by the fan. On the size 025–071 GTLF fans, the inlet is directly deep-pressed into the end walls. The inlet cones of the GTLB fans are deep-drawn in one piece and are fitted to end walls of a common GTLF fan casing. This provides the GTLB fan casings with additional rigidity. On the size 080–140 fans, the inlet cone is made separately for both types of fan and directly fitted to the end walls.